Sup Adabi, hmm, definitely not something I was brought up eating or drinking. Mom, never encouraged us to cook soup using soup cubes. Soups are supposed to be done slowly, using herbs, free range chicken, and double boiled for many hours. 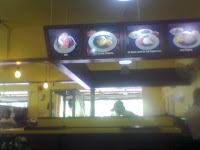 So the first impression I got when I saw this restaurant at Tmn Melati , was just that.. Instant Soup and Rice. What so nice ? Firstly, the restaurant does justice to itself. Decoration wise, quite decently done. It gives you a spacious feeling, not cramped up like most chinese Restaurants like Six Happiness, Overseas where they like to put in the most number of tables possible for the space they rented. No flies bugging you like most Malay eateries. Its not stuff , humid and hot like most stalls you find by the roadside, but neither is it air conditioned. Nevertheless, we did not feel very hot when in the restaurant. The menu was quite extensive. Usually a malay eatery will give you a piece of paper, printed on both sides and thats it. Their menu takes time to explain what is in a dish. I ordered a Sup Ayam Kampung Warisan Set, which comes with Kangkung Belacan, White Rice and Telur Dadar. To top it up, I also ordered Epal, Asam Boi and Limau Kasturi Mix Drink (KatChai Shin Mui with Apple Juice - confirm no lao sai and tastes very very nice). Four of us, ordered four sets. Two of them ordered Sup Tulang Nusantara Set. 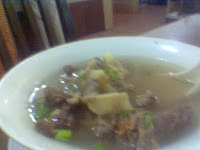 It was a clear soup with tulang and daging in it. Soup ayam warisan is the standard spicy soup , which we normally get when we order Mee Soto Ayam. Nice !! To cap it off, we had Ice Kacang which I thought could improve abit. It was too sweet for one, and the ingredients were red jelly, green jelly, Canned Red Beans, Chendol ( not so fresh), Watered Down Gula Melaka, Too much Sirap Ros and not enough Milk for my liking. Oh ya not forgeting Roti Arab... It was a weird crepe of somekind, I suppose of Middle East origin, didn't like it, but it came with Sambar and Sambal ikan Bilis. 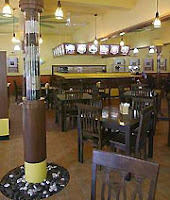 To summise, this place is quite pricey, but then, the food seems clean and the environment quite nice. Food , ok la only.